Commonly referred to as baby back ribs, pork loin ribs are taken from the upper part of the pig's ribcage. You can easily customize your pork loin ribs with your favorite sauces or dry rubs. Slow cook thick pork loin ribs in the oven to avoid the pesky prep time and clean up that goes hand in hand with grilling. To prevent your ribs from drying out, The Kitchn recommends basting your ribs with barbecue sauce about 30 minutes before they finish baking. Remove the pork loin ribs from the plastic packaging. Rinse them with cool water to wash away any stray bone fragments. 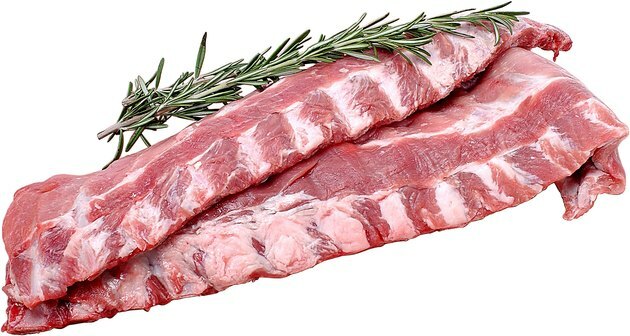 Pat the ribs dry with a paper towel and place them onto a clean cutting board. Turn the ribs upside down and insert a kitchen knife under the silver skin membrane. Pull off the membrane to prevent your ribs from becoming leathery during the baking process. Trim the excess fat from the edges of the thick loin ribs using the kitchen knife. Align the ribs onto a baking sheet lined with tinfoil. Cover both sides of the ribs with your favorite dry rub or barbecue sauce. Rub it evenly across the exterior of the ribs using your hands. Wrap foil around the ribs to cover them completely. Preheat your oven to 300 degrees Fahrenheit. Place the baking sheet onto the top rack and bake your ribs for 1 1/2 to 2 hours. Remove the ribs from the oven about 30 minutes before they finish cooking. Apply barbecue sauce to both sides of the ribs with a basting brush. Cover with foil and place in the oven to complete the cooking process. Check the internal temperature with a meat thermometer to ensure it has reached 145 F.
Allow the pork loin ribs to rest after cooking to seal in the internal juices. Southern Plate: Tender Babyback Ribs -- In the Oven!